First Line: Be careful what you wish for, as they say. 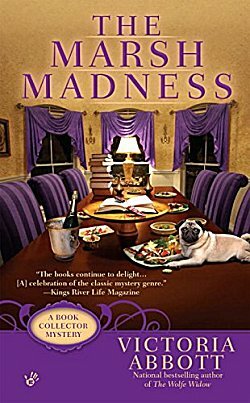 When the heir to the Kauffman fortune offers his fine collection of first edition Ngaio Marsh mysteries at a very good price, Jordan Bingham and her employer, the inimitable Vera Van Alst, can't believe their luck. Jordan dresses in her best vintage fashions in order to join Vera and Chadwick Kauffman at Kauffman's fabled estate, Summerlea, to hand over the money and finalize the sale of the books. The next day Jordan and Vera are flabbergasted when they learn that Kauffman is dead-- found at the foot of the grand staircase at Summerlea. When Jordan sees that the photo in the paper is of a different man, it becomes crystal clear that they are the victims of a scam-- and being framed for murder. (Even Jordan's Uncle Kevin!) Jordan is going to have to use all her street smarts-- and every tip Marsh's fictional Roderick Alleyn can give her-- to keep them out of prison. I've been a fan of Victoria Abbott's Book Collector series since the first, The Christie Curse, but in this fourth installment the series has come into its own in glorious style. All the elements mesh together perfectly. The humor is often laugh-out-loud funny, and the plot is a knockout. At first I couldn't believe that Jordan and Vera could be so naive about their Marsh windfall, but when I was proved right, the story immediately kicked into another gear that took me straight to the realm of "What in the world is going on?!?" The characters are a delight. Jordan, with her love of vintage fashion, Signora Pantone's cooking, her job, and her family's background in the shadier side of commerce. Jordan's Uncle Kevin, who's a one-man disaster area waiting to touch down. Vera's got the curmudgeon-with-tunnel-vision down to a fine art. Friends like Cherie and Lance know just how and when to lend a helping hand. And you can always count on Signora Panetone to make sure you won't faint from hunger. Even the animals in the book-- Walter the pug, Good Cat, and Bad Cat-- have their own wonderful DeMille-like closeups. Detectives Castellano and Stoddard are the only blights on The Marsh Madness's landscape, but even they did their jobs well, since they really made me fear for Jordan. I could rave about this book for quite some time, but I won't. Instead I'll end with an added bonus this series has given me: the incentive to read books written by the Golden Age authors it has covered. Since I've been avoiding the aforementioned authors for years, that's quite some added bonus. I can't wait to see where this series takes me next. Book collections? Vintage places and fashions? Good story? What's not to like?!? Thanks for pointing me in this direction, Cathy. Thanks so much, Cathy! We are thrilled with your review. This is my favorite kind of review to compose, and you made it very easy by writing such a wonderful tale! I've read one of these books but you have enticed me to return to see what I've been missing. It's always been a fun series, but the authors have really hit their stride with this one.